The 104' Cockpit Motor yacht 'Isabella' was built by Broward in theUnited States at their Saugatuck, MI shipyard. This luxury vessel's sophisticated exterior design and engineering are the work of Broward. Her luxurious interior was originally designed by Dee Robinson Interiors. Her exterior is styled by the Broward team who are also responsible for the entire engineering package. Her current owner has continually refitted many aspects of this yachts systems and finishes. ACCOMMODATION Isabella'sinterior configuration has been designed to comfortably accommodate up to 6 guests overnight in 3 cabins, comprising a master suite, 1 VIP stateroom, 1 twin cabin and 1 Pullman bed. She is also capable of carrying up to 3 crew onboard in 2 (Oversized) cabins to ensure a relaxed luxury yacht experience. CONSTRUCTION & DIMENSIONS Isabella features a semi-displacement aluminum hull and superstructure, with teak decks. Motor yacht Isabella is equipped with an ultra-modern stabilization system which reduces roll motion effect and results in a smoother more enjoyable cruising experience underway. PERFORMANCE Powered by 2 Detroit Diesel (16 V 92 TA) 1,449hp diesel engines and propelled by her twin screw propellers. She is capable of a top speed of 23 knots and comfortably cruises at 19 knots. She can carry around 9,100 of diesel on-board in her fuel tanks. Recent full bottom service and running gear. More details and photos to follow soon. United Yacht Sales New Jersey would love to guide you through a personal showing of this 104' Broward Cockpit Motor Yacht 1989. 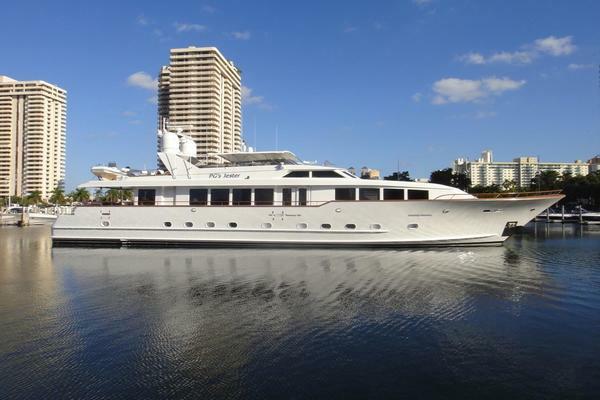 This yacht for sale is located in Miami, Florida and priced at $1,465,000. For a showing please contact us by filling out the form on this page and we will get back to you shortly!